Many of you already know, but during most of last year, I worked on a series for National Geographic Channel called ‘The Secrets of Wild India’ along with Sara and Mandanna. The films is finally ready and will air early the coming week in India. It has already aired in the UK. Its a 3-part episode and the first part was filmed by Sandesh in Kaziranga and we shot the second two parts in Tadoba and Gujarat. 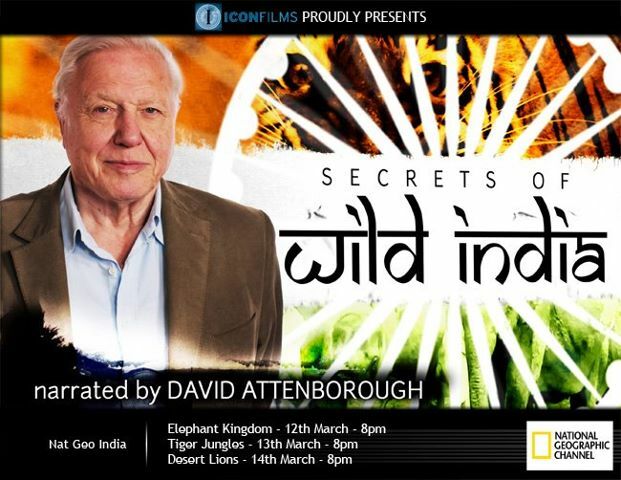 It has been a privilege to work on this production, especially the fact that David Attenborough has narrated it. Do catch the show and would love to hear what you think about it. That’s super news Kalyan. All the best. What was your role? Were you a sequence cameraman? i think i saw the 1st part – elephant kingdom, last saturday on nat geo wild. For those of us without access to Nat Geo TV channel, is this show, ummm, available at any of the popular torrent search sites? Waiting for the HD videos. Awsome Kalyan will try to catch it. Great work. Hi Kalyan, saw the screening of this episode today, kudos on a job well done! Seen “Tiger Jungles” last night, excellent program. Very informative. Watched Desert Lions yesterday. There seem to be a bit of disconnect in the story. The only Lions shown were all from Gir which is definitely not a desert. Also many of the sub plots were left hanging like the leopard, the desert fox, the desert cat etc. BTW, curious to know was the Hyena footage chopped off in the final cut? But a very commendable effort nonetheless. Hope to see more such informative programs involving you! Great job Kalyan da. At many time we can see the african wildlife in Net geo or Discovery channel. But there are many secrets in wildlife in India also. We do not know them properly. So “Secrets of Wild India” is the great programme for us to know about wildlife of our country. All I can say is..THANK YOU. I watch these episodes over and over and they just fascinateme more each time.